Embroidered with a lace this gauzy long cross skirt is just the way to spice up your wardrobe. Gorgeous Renaissance design and very feminine & timeless. Drawstring and elastic waist band makes this skirt very comfortable and fit. Wear this relaxed skirt with your favorite tops or tunic. Matching top is also available. Made with love and care by our skill artisan in India. Excellent Quality. NOTE: Please check out matching top 504 (ASIN B006X41IBC ) or 502 (ASIN B007W6P28U) sold separetely. Color may vary a bit but goes well together. 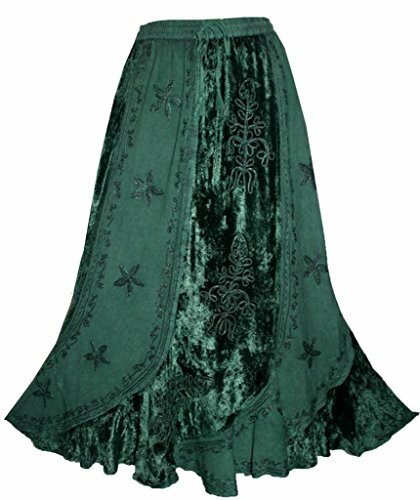 Medieval Rennaissance Peasant Gypsy Skirt. Please check the Agan Traders Measurement Chart on the top left hand corner for sizing information.